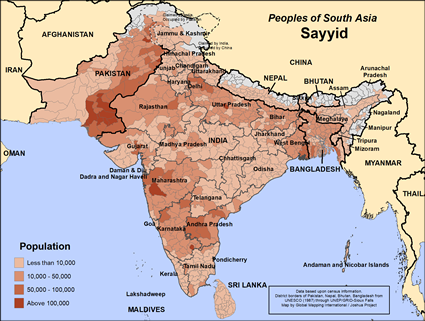 The Sayyid or Syed are among the largest of Muslim communities of India, Pakistan, Nepal and Bangladesh. They are said to trace their lineage directly back to the daughter of the Prophet Mohammad himself, Syed-un-Nisa Fatima Zehra. The Sayyid in South Asia came to India by sea over 600 years ago. Today they number over 13 million with over 60,000 in Nepal. The Sayyid occupy the highest of social class among Muslims. 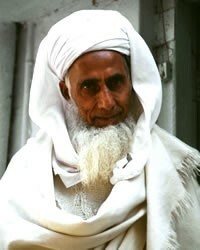 They are traditionally the priests and religious teachers of the Muslim communities. More recently they can be found in a host of government service, teaching and business occupations. They marry mainly among their own clans and other Ashraf category Muslims. The Sayyid speak many languages in Nepal but the largest are Maithili, Nepali, Urdu and Bhojpuri. The Sayyid can be found in both major sect divisions of the Shia and the Sunni. Because of their position as religious teachers and priests they are considered 100% Muslim in each of the countries where their live. Because of the shear religious and political weight that the Sayyid carry in their respective communities, a transformed Sayyid leader for Christ could have influence like that of "Paul" in his day. Whole districts could be converted to be followers of Jesus (whom Muslims call Isa al-Masih) if Sayyid leaders came to know and trust the Truth. Pray for dreams and visions among these people during this month. View Sayyid in all countries.